There’s a cacao planting boom throughout the Amazon basin countries, which is usually good news for farmers and for governments, but farmers sometimes clear priceless native forest to establish new cacao plantations. Jacob Olander of Canopy Bridge examines the consequences, and takes stock of solutions. This story is cross-posted on Canopy Bridge, a Forest Trends affiliate that links buyers and sellers of agroforestry products. 27 November 2015 | On a Saturday afternoon in late September in the Peruvian jungle town of Satipo, Jonatan Ayala Lombardi offers up a chocolate surprise. Jonatan is the general manager of the Satipo Cooperative, which sells hundreds of tons of cacao and coffee from its 620 farmer members from this frontier region where the Andes meld into the Amazon lowlands. The chocolate is one of a limited run of bars that Satipo is starting to produce to add value to farmers’ raw cacao beans. It has notes of prune, caramel and—odd but unmistakable once you’ve picked it out—coca leaf. “Where was it harvested?” Maya asks. It turns out that the cacao that went into that chocolate bar was very close to disappearing forever. The only known source for these beans was a quarter-hectare stand of aging cacao trees that Luisa Maria Veliz Meza was getting ready to cut down to replace with new varieties, expected to give her better yields and more income. This story is being repeated throughout the Amazon—more often than not without the saved-in-the-nick-of time happy ending. And indigenous peoples, perhaps unsurprisingly, are at the heart of most of them. The Kichwa people of the Ecuadorian organization, Wiñak, produce prized Nacional cacao, and have also rediscovered small wild stands of cacao trees in their comunal forests, with white, porcelana-type beans. The Awajun working together under Tajimat conserve native varieties in the northern Amazon of Peru, almost forgotten in their traditional farm plots but now drawing visits to their remote jungle villages from renowned chocolatiers. In Bolivia, Yucare communities have reached global markets with some of the most exclusive beans in the world, harvested directly form wild forest stands. The Paiter Surui in Brazil are exploring similar options for bringing their wild cacao to market. In each of these cases the beans are the product of a long, and now very fragile, process of cultural and environmental stewardship. Indigenous communities have and continue to play a central role in the survival of cacao diversity. Though Europeans came to know chocolātl cacao in present-day Mexico at the time of the Conquest, the deep ancestry of cacao is almost surely from the Amazon basin in South America. Recent studies indicate that the ‘primary’ Amazon forest has been largely altered over generations of human presence, and many of these wild cacao varieties may have been shaped by millennia of indigenous management. Where those cacao trees continue to thrive in native forests, they are in many cases there because indigenous peoples have consistently proven more adept than others in conserving forests on their lands. Deforestation and climate change pose imminent and growing threats to this legacy and the potential of these native cacao. As thousands of square kilometers of forest are logged or cleared for cattle ranching, soy bean cultivation or palm oil, more of the rich array of cacaos is wiped off the map. And in some cases, it’s the growing world appetite for cacao itself that’s driving the process. There’s a cacao planting boom throughout the Amazon basin countries, which is usually good news for farmers and for governments: An important source of foreign exchange and improved incomes for producers. But farmers sometimes clear priceless native forest to establish new cacao plantations. In one egregious case from Peru, one company cleared over 2000 hectares of forest to establish “sustainable” cacao, and small farm plots throughout the region are fraying the fabric of the forest. Much of this is bulk cacao, productive but unremarkable cultivars like CCN51. It would be comfortable to be able to pin the blame on big bad, bulk, commodity, industrial cocoa. But the demand for fine and flavor specialty cacao plays its role as well. Ecuador, Peru, Bolivia and Colombia together account for the majority of the world’s production of fine flavor cacao. In these biodiverse Amazonian countries, it is these varieties too that may be contributing to deforestation. To avoid that deforestation footprint what we’d like to see is higher, improved yields from already cleared areas and from existing, underperforming plantations—better incomes from the farm reducing the need to cut down more forest. But even with this focus on deforestation-free intensification, native cacao is at risk—as in the case from Satipo and others that I’ve visited in Peru and Ecuador. Grafting allows farmers to incorporate cacao varieties that are resistant to diseases that sound like medieval plagues—things like witches’ broom and black pod rot—and give the new cocoa crop a jump start by drawing on the reserves of long-established root stock. But in the process, the rich varieties of native cacao are buried and lost under the vigorous new growth of the improved cultivars. Modern plant breeders are acutely aware of the need to conserve this rich array of cacao varieties. Not only do these cacao trees have unique flavor profiles that chocolate connoisseurs find compelling, some have genes, selected for under the punishing, humid tropical conditions of the Amazon, that confer resistance to diseases and make them more productive. While germplasm banks and research institutions have a key role to play in safeguarding, managing and disseminating cacao varieties, there is no doubt that conserving the trees in the farms and forests where they evolved, and continue to evolve, is crucial. 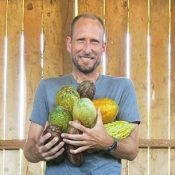 The problem is that while having farmers conserve their native varieties makes all the sense in the world for the future of chocolate, it doesn’t always make a lot of sense for the farmers themselves. Many of these native varieties do yield less—often only half or a third of what improved varieties can provide for farmers. And in most cases, the markets and supply chains they feed into don’t differentiate the small volumes of extraordinary cacao from all the rest, so there is little if any price premium to offset the reduced yields. Farmers shouldn’t be expected to shoulder the costs of ensuring our fine chocolate experience and the genetic resilience on which a multi-billion dollar industry depends. They are providing an invaluable service for everyone that loves chocolate and contributing to conserving huge swaths of Amazon forest, keeping billions of tons of CO2 out of the atmosphere to boot. The solution is going to require focused partnerships between farmers, industry and government. Fortunately these have the potential to yield powerful benefits for rural families, companies concerned with secure supply chains and the conservation of Amazon forests. Careful treatment of rights and intellectual property issues that allow indigenous peoples to be adequately recognized and rewarded for their current and historical contributions. Cacao is going to play an outsize role in shaping the economies and landscapes of some areas of the Amazon over the next decade. Explorations like our recent sourcing trips reveal hidden gems. Satipo is in the process of scaling up production of its rare cacao and conducting a genetic survey of other farmer-held trees. Other indigenous groups are working closely with sophisticated and conscientious international buyers like Uncommon and Taza to reflect the true value of their product and their work. The urgent need to value and conserve cacao and its forest home is matched by the exciting potential. There’s a win-win-win to be had—for farmers, forests and industry—giving us phenomenal chocolate to boot. Sweet. Special thanks to the United States Agency for International Development (USAID) who, together with the Environmental Defense Fund, under the AIME Program, provided funding and support for the sourcing trip to Peru for Taza Chocolate and Uncommon Cocoa Group. Jacob Olander is Managing Partner of environmental services group EcoDecisión and co-founder of CanopyBridge, which is a global directory and network helping buyers and suppliers of sustainable crops and wild-harvested products to find each other and build relationships. He can be reached at jolander@canopybridge.com.